This entry was posted on April 4, 2017 by Nick. 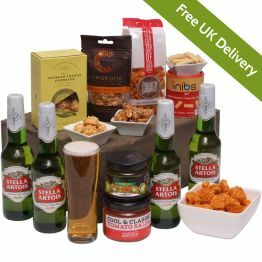 Hamper.com has a fantastic collection of beer hampers that are perfect for almost any occasion. From traditional supermarket favourites to unique and interesting craft beers, we choose the finest bitters, lagers and ales to go into our delicious beer gift hampers. Discover the full collection of beer gift hampers that we have available. 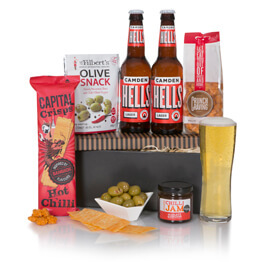 From Spanish and Australian themed hampers to traditional British ales, find the perfect gift at Hamper.com! The Taste of Spain gift hamper if perfect for enjoying on a hot summer day! The delicious tortilla chips, gourmet dip, olives and salted corn are accompanied perfectly by three bottles of refreshing San Miguel premium lager. 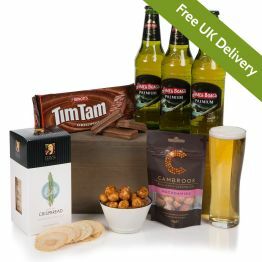 The Australian Beer Hamper is a fantastic way for someone to experience flavours and brands that they’ve never tried before. The James Boag lager is paired to perfection with a range of authentic Australian treats, including Anzac biscuits, macadamia nuts and the always popular Tim Tams! 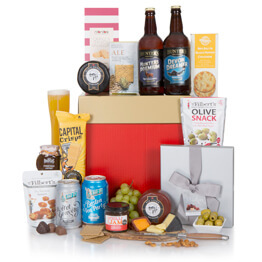 If he prefers ales to lagers, then the Real Ale Hamper for Him will go down a treat! 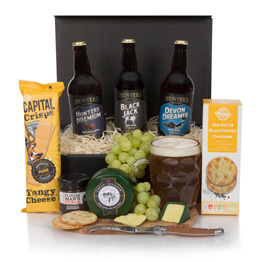 He can enjoy three delicious ales from Hunters Brewery – Devon Dreamer Ale, Black Jack Ale and Premium Ale, before indulging in Black Bomber cheese, stilton and fig biscuits and Ploughmans pickle. 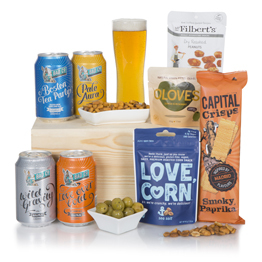 Perfect for enjoying with friends, the Beers and Bites gift hamper is Hamper.com’s best-selling beer gift and it is easy to see why! Four bottles of Stella Artois are accompanied by sweet caramelised peanuts, cheddar cheese crumbles, spicy jalapeno dip, classic tomato salsa and chilli rice crackers! 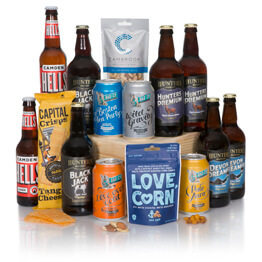 Packed with a fantastic range of delicious treats, the Beer Feast Hamper is perfect for any occasion, including birthdays, Father’s Day and more! 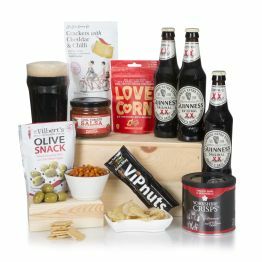 Three bottles of Greene King IPA Ale are joined by smoked cheddar cheese, salted corn, delicious pate and cheese straws to create a tasty hamper! Although our alcohol gift hampers are perfect for any occasion and any adult, they are especially ideal as Father’s Day gifts. Father’s Day falls on the 18th of June this year and there’s no better way of showing how much he is appreciated than with a beer hamper! You can find a complete Father's Day gift guide here. For more information on the full range of next day hampers that we have available, please get in touch today. Contact us online or speak to a helpful member of our team directly by calling us on 01235 833732. We are happy to answer any questions you may have about our range of gifts.